Although Falkirk forwards John Baird and Bob McHugh didn’t score in the 2-1 win over Dunfermline last Saturday, Baird was delighted they contributed in other areas. Baird (31) told the Falkirk Herald: “If I scored one goal on Saturday but I was poor, the gaffer wouldn’t be happy because we probably wouldn’t have won the game. “I think if myself and Bob are playing like that on a Saturday then the goals will come anyway. The team will win games. “If strikers can keep the ball so many times out of 10 up the park it helps you win the game because you are not giving the ball away. “It is a massive help. Baird was happy to put himself about physically against Dunfermline defender Lee Ashcroft – a much taller man – during Saturday’s game. “The physical aspect of the game doesn’t bother me,” Baird said. “I think I’m one of those sizes that I’m quite awkward for people. Baird and his mates will try and make it six league wins from seven in this Saturday’s home game against his former club Raith Rovers. Baird said: “Every game in this division is tough. 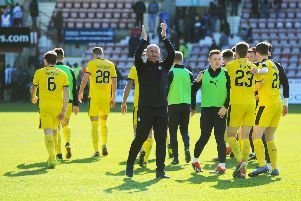 “Even Ayr (who Falkirk recently lost 1-0 to in the Challenge Cup after beating them 2-0 in the league) have provided the two hardest games we’ve been involved in this season. “But we know what Raith are about and what we are about, so I’m sure if we perform we’ll win the game.